Prime Minister Nguyễn Tấn Dũng launched the Block B-Ô Môn gas project by the Việt Nam National Oil and Gas Group (PetroVietnam) in the southern province of Kiên Giang yesterday. 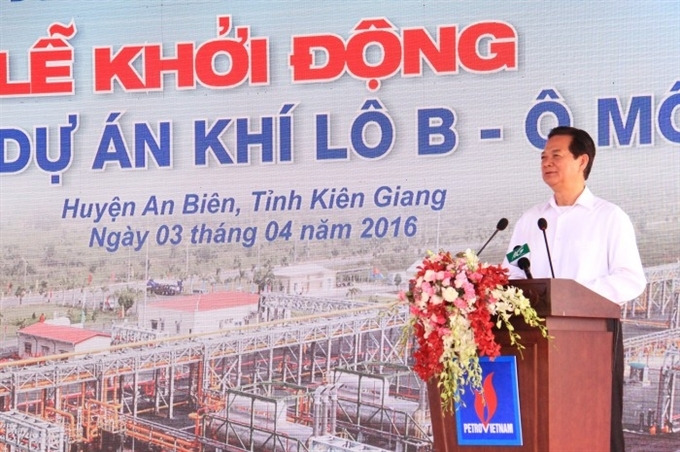 KIÊN GIANG (VNS) — Prime Minister Nguyễn Tấn Dũng launched the Block B-Ô Môn gas project by the Việt Nam National Oil and Gas Group (PetroVietnam) in the southern province of Kiên Giang yesterday. The project hopes to collect 107 billion cubic metres of gas and 12.65 million barrels of condensate from offshore Block B. Around 5.06 billion cubic metres of gas are expected to be brought ashore per year from 2020 to 2040 to fuel power plants in Kiên Giang and Ô Môn District of Cần Thơ City. The development of Block B will cost US$6.8 billion within 20 years, covering one technology centre and 46 drilling platforms, one accommodation platform, one condensate tank, and approximately 750 drilling wells. The Block B – Ô Môn gas pipeline worth US$1.2 billion is designed to have a capacity of 20.3 million cubic metres. It will transport gas from Block B to An Minh District in Kiên Giang province and supplement gas for the PM3 – Cà Mau pipeline. The 431km pipeline is also expected to provide gas for a number of gas turbine power plants in the two Mekong Delta localities. The projects will be put into operation in the second quarter of 2020. Prime Minister Dũng hailed PetroVietnam’s endeavours and asked it to ensure project safety, quality, efficiency and progress.